Last year i did a review and setup guide for the Vortex 250 Pro. In the months after i pimped and tuned it a few times. Now it’s time to do the same for the Vortex 150 mini! The parts used in this kit makes it ready to fly, crash, repair and repeat 🙂 What also is a treat that i will tests the Fat Shark Attitude V4 Anniversary Edition goggles! Love my Dominator V3 but this one will come close to it in 4:3 instead of 16:9. This will come in a separate review. This will be a live post and grow with more information when using it more and more! Change the lead on the vortex 150 to a XT60. Change your battery to XT30 connector. Buy new batteries with XT30 connector like the Tattu 850mAh 14.8V 75C 4S1P Lipo. Setting up the Spektrum DSMX Quad Race Receiver with Diversity is pretty easy. The Spektrum cable is connected by default in the vortex 150. You need to unscrew the 8 top screws and you have full access to the inside. Be Aware, betaflight 3.1.7 has issues where your vortex will yaw and wobble when punching out! This can be temporarily fixed to enable AirMode either to the arm switch or permanently. Out of the box my vortex came with v1.0.0.35. currently (22 june) the newest firmware is v1.0.0.41 release on 03/27/2017. Sometimes it may need few attempts before it starts flashing (the vortex-configurator will do it for you). Retry the entire procedure for flight controller if it does not work the first time. Also the verification sometimes fails, but upgrade is just fine. In that case check with betaflight-configurator(**) if flight controller is fine. Be aware, updating the betaflight will give you a timeout but this is ok!! Flash is correct but verification just fails. Known issue. The quad will beep different, wait a minute and disconnect it. then power cycle the quad by disconnecting the battery and attaching it again. WARNING: You may have to force Serial RX on UART3 after. Don’t forget to configure Receiver too if it happens!! Choose your model from your Tx and go into the system setup. Scroll down to channel assign , click the roller , and hit next. Confirm you’re in the tab called ”Channel input Config”. Channel 5 , named gear, is a 3 way switch designated to choose flight modes. Click on Channel 6 , (Aux 1 in your tx ), and flip or choose the switch you’d like to use to arm/disarm and click the roller to save. Do this three times, because you have Acro mode, Angle mode and horizon mode. You will need to map the channel on all 3 modes. Now boot up Betaflight , and look at the receiver tab to confirm that particular switch’s movement registers. Finally you can go into the modes tab , hover over the box marked ”arm”, and select the aux channel that corresponds with your switch. You can see a little yellow line moving along with the travel of your switch. Now make sure the yellow slider bar is in the range of the position you’d like to arm. Hit save ! and now confirm the ”arm” box becomes yellow when moving the switch in the position you told it to arm. Created a custom profile for you Spektrum! download is below. This has all the tweaks done and you will only need to map the ARM switch if you want one. Just did my first 4 lipo packs with the Vortex 150 and wow.. it’s like a hulk in small size! I does not feel like a brick or what so ever. It’s very agile and it packs one hell of a punch. Did eventually swap out the props for the DAL T3045 Indestructible Bullnose Propellers because the stock are quite flexible.. when you punch it tends to drift. With the DAL T3045 this is not the case. These DAL props are a little thicker and sturdy. Switched back to the stock props after tuning the crap our of the vortex. earlier i mentioned that i had some issues and switched to the DAL T3045 but those are a pain to mount properly because the mounting holes of the props are really tight. The vortex is a mini hulk with much power. It flies like it’s brother the 250. I love it’s small size, fits trough the little cracks and makes flying real fun. Upgrading the betaflight firmware 3.17 provided by immersionRC has a bug. Bypass by enabling AirMode as a mode on the arm switch or enable it by default as a feature.. Default camera setup is too dark. you need to tune it a little. Ability to carry a go pro or other kind of cam is a pity but hey.. look at it’s damn size. This is one sick puppy to fly! Love flying it and due to it’s small size i take i almost everywhere. never missing a awesome spot to fly when you see it. Yeah already working on some upgrades. Waiting on the pimp kit from flite test. This will turn the 150 in to a stealthy black knight rider. Also ordered some clear props. Note that all pictures do not show the middle frame but it is included! also the stickers for the arms are. So the goodies came in and i went in to change the looks. First of all remove the top plate with the 8 screws. Then unplug the camera cable. I just did a arm a time. Unscrew the 4 motor screws and then remove the carbon. Then you can unscrew the arm from the bottom and get it loose. Just keep on changing those arms. After your done you can change the middle frame. 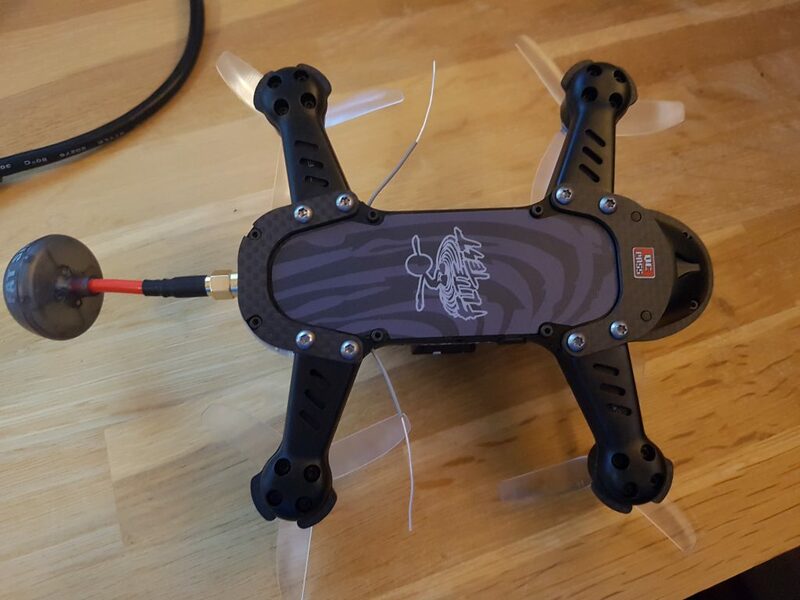 Note that you need to remove the VTX from the back. The Tramp is hold down with 3 screws and the middle frame with 4 on the bottom. Now that’s done you can change the camera cover. This is only mounted with 2 screws on the bottom. After removing those the top comes of. Then you can remove the camera from the casing. This can be a tight fit. I also mounted the camera mount to carry a small cameras. Nice review and pics about the Vortex 150.I like it! I have a question about this copter. I’ve modified it a bit with 4000 kv engines and BlHeli32 ESC. Now is my problem the BlHeli32 ESC’s are not recognized by the FC because only Betaflight 3.0.2 is installed. Used is Betaflight 3.2. The built-in “IRCsynergyF3” is not listed in the Betaflight Suite. Which FC should I select there to the flash? You need the IRCSynergyF3 and thats only supplied by ImmersionRC. Great review and pictures. It has helped me a lot. I have not found a more detailed, step-by-step review as this one. Loved it. I’ve done all the updates and they took perfectly. Thank you. 1. In “HW Cabling – Telemetry pin connected to GPS connector RX pin on PDB. The telemetry pin to be connected to the GPS connector RX” … Is this Telemetry pin on the receiver? I currently have an XSR FrSky receiver. 2. After I configure UART2 for Smart Port Telemetry Output you warn: “You may have to force Serial RX on UART3 after”. What do you mean by “force” ? How do I force it? 3. In the next step you mention: “Don’t forget to configure Receiver too if it happens!!”. I use a FrSky Taranis X9D Plus. What exactly do I need to configure on my receiver if this happens? Thanks again for the article and your help. 1. I do not have experience with FrSky. Im a spektrum guy:) If your receiver is telemetry enabled it should have a connector. Do not think your receiver is capable. 2. By forcing it means toggeling the switch like in the preview picture. I do get some telemetry on the transmitter, like RSSI and battery voltage, however, this telemetry is not accurate compared to the telemetry info I see on my display. Given that the telemetry info on my display comes from the Vx and the info on my transmitter comes from my Rx, this leads me to believe that I may have not configured something properly, either on the receiver or transmitter side and why I’m asking. Other than how to bind it and configure the failsafe it pretty much doesn’t give you more info. Hi. Good mini review. I have the DX6e and am only getting about 200m range before fail safe kicks in – done it twice in the same spot and same range. Video TX is fine but drops out of the sky onto grass so no damage. What range would you expect from this as it’s only a 150 size ? My antenna’s are out the sides as they were on taking it out of the box. Closer and it does everything it should and is super stable with no computer setup done. Thanks in advance. Hi, put the antennas towards the front instead of the back. Like I did in one of the last pictures converting it to the black pimpkit. Had range issues too and that’s because the VTX antenna is interfering. Had the VTX power on higher then 25mw right? Moving them to the front solves that. I know it’s risky but you can just hotglu the cam board on the bottom plate and also use some foam bumpers so the copter doesnt land on the split’s board. it’s the only place I found for the board. inside there’s really no space.